Halloween is just a few days away, you have no costume lined up, and you’re flat broke. What the heck are you going to do? Well, here is where your love of emojis comes into play. 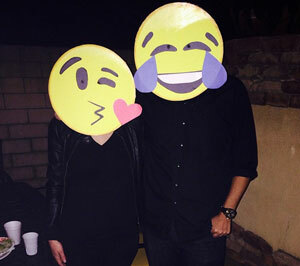 That’s right, you can turn some of your all-time favorite emojis into cheap and still insanely creative halloween costumes. All you’ll need for these amazing costumes is some household items, tape, scissors, cardboard, and maybe even a trip to the thrift store. We assure you that these costumes are going to look fantastic and you will be the talk of the party as soon as you enter the door. Without further adieu, here are the top five emoji halloween costumes you should don this October 31st. Ahh yes, the old emoji standbys. Easily the most recognizable emojis and probably the easiest to put together. Just find some yellow construction paper, some markers, and some string and you’ve got yourself two good looking faces. Here we have the cute cat with heart eyes emoji. The hardest part of this getup is the fur. However, we suggest finding an old furry stuffed animal and gutting it for your headpiece. 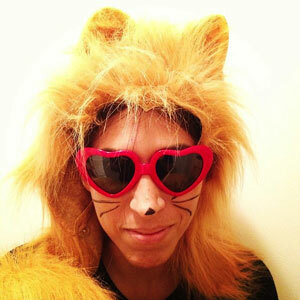 Then, just head down to the dollar store and pick yourself up some cheapy heart sunglasses. 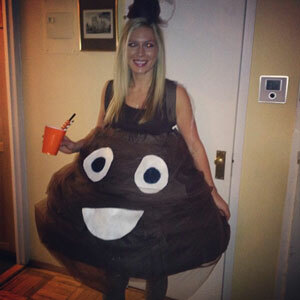 Girls, you probably already have this costume covered. Just find yourself a friend, two black dresses, two blonde wigs (or just be blonde), and a head band. Then dance the night away with your twin in hand. Look, an emoji costume that keeps on point with the spooky halloween theme. 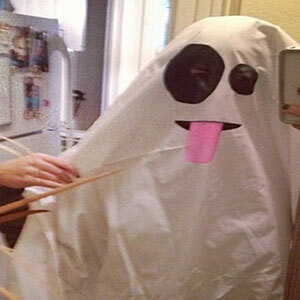 Find a sheet, cut some eyes holes, draw on a tongue and black patches. If you’re not feeling lazy you can also add in a movable tongue from the mouth by simple cutting up some pink fabric. This is my personal favorite emoji because I’m super mature like that. Now this one may take some extra time, but we assure you once you put this on, you’ve already won halloween. Just get a brown sheet, some suspenders, cut some fabric and stuff yourself with something fluffy to give it that 3D poop illusion.